There’s plenty of fish in the sea, but not enough in my glass! What a difference 2 weeks makes! We went from 2+ feet of snow to 73 degrees and sunny. 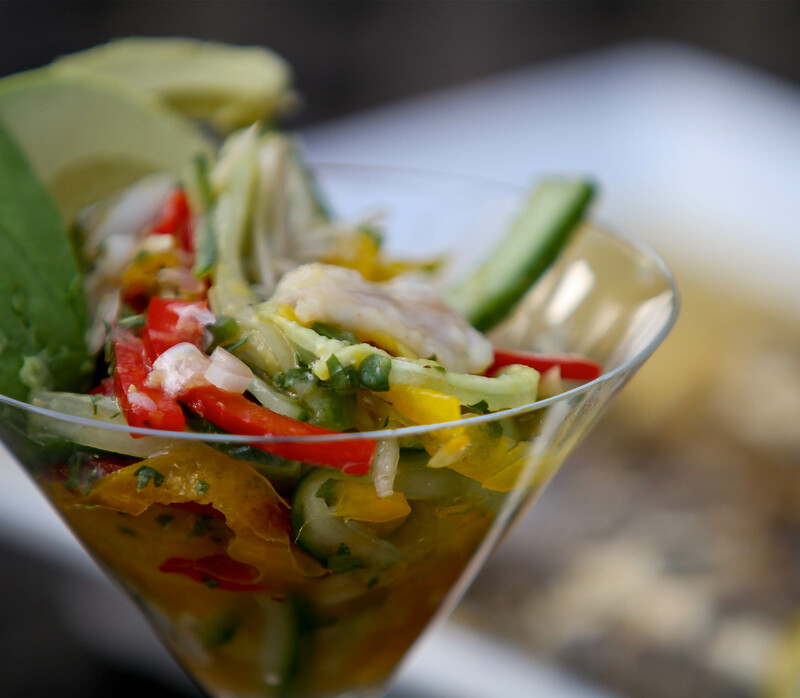 Something tells me that mother nature isn’t through with us yet, but with the temporary arrival of summer it was a nice day to relax outside with some white wine and ceviche. The ceviche was so much fun to make and eat that it is on the short list for our next party or future TJCC episode. Make sure your fish is really fresh. Technically you don’t eat it raw, but without heat it certainly feels that way. PS: We learned this recipe from Franck Delatrain who is the head chef at Cafe Centro in NYC. This restaurant hosts cooking demonstrations / lessons periodically and Nicole and I try to attend every chance we get! Place all ingredients except avocado and olive oil into covered non-reactive container such that all ingredients are submerged — be liberal with the kosher salt to balance out the sweetness a little bit. Refrigerate for an hour or so to allow the fish to ‘cook’ in its acidic bath. Serve in martini glasses, placing a few avocado slices on top and drizzle with a little good olive oil and some sea salt. I can relate to the excitement due to the great weather! I looove!!! Ceviche and I am picky too! I only like good ones! 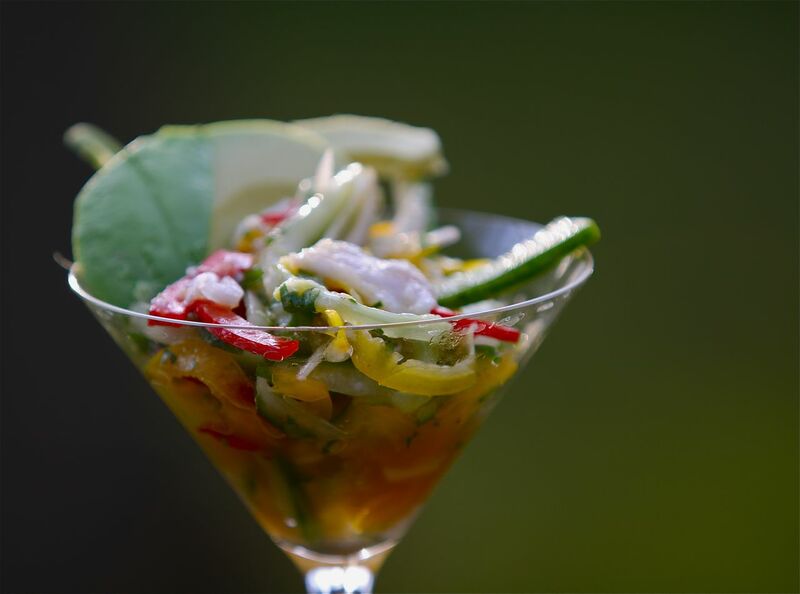 Your recipe is great with all the ingredients to achieve a great ceviche! I spent an entire weekend in Cancun eating ceviche after ceviche until I found one place that had a great one! Look forward to making some of your food, your site looks really interesting! Don’t worry about doing 10 sites. Just sport the award – or not. You deserve some attention, and I was hoping to get you a little. Some of the sites that I listed are really fantastic. Others are just good writers – each for their own reason. I was just passing the good feeling on… and I thing that is nice to do now and then. Don’t worry about doing 10 – just enjoy your e=well deserved moment in my corner of the sun! From one Jew to another..YES, you certainly can cook! That ceviche looks marvelous. Great blog you have here! Thanks, Lisa! Hope to see you around and check out your blog! btw, I saw your comment about competing against your Sunday Sauce recipe. If I am not mistaken, I think Valerie is using my recipe with her own twist to it, to compete with you. Thanks for the thumbs-up, I look forward to seeing your ceviche recipe — would love to learn a new way to make it! Looking forward to seeing Val’s rendition of your recipe, I think I may try your recipe as well — if it tastes as good as it looks, it sure to be a winner! OK – send me the lobster recipe – or, better yet… make it! And, I am putting this dish on the list for my parents 60th anniversary in November… but I hope to make it before! Val, when you say ‘this dish’, do you mean the ceviche, the lobster fingers or the lobster ravioli? Or better yet, all three! Found you in the “introduce yourself” portion of foodieblofroll. I adore your blog! Awesome, fun and informative. And yes, I now have to try the ceviche! Thanks Lindsey, glad you enjoyed the blog…Let me know how the cevice comes out, and if you take a picture we can set up another “you vs Jew” page. Hey Andy- Cape May Gallery wife here!!! Thanks for introducing Pierce to the site. . .maybe now he will think experimenting with new foods is cool or macho or something! Can’t wait to try some of these . . making my mouth water! Hey Kelly, glad you and Pierce like the site…let me know if you make anything, would love to know how it came out!